Is a Milestone Credit Card Right for You? If you have a low credit score, you may decide to follow the advice given by experts for rebuilding credit: using an unsecured credit card. There are several unsecured credit cards available for consumers with a bad credit score. One of them is the Milestone credit card. 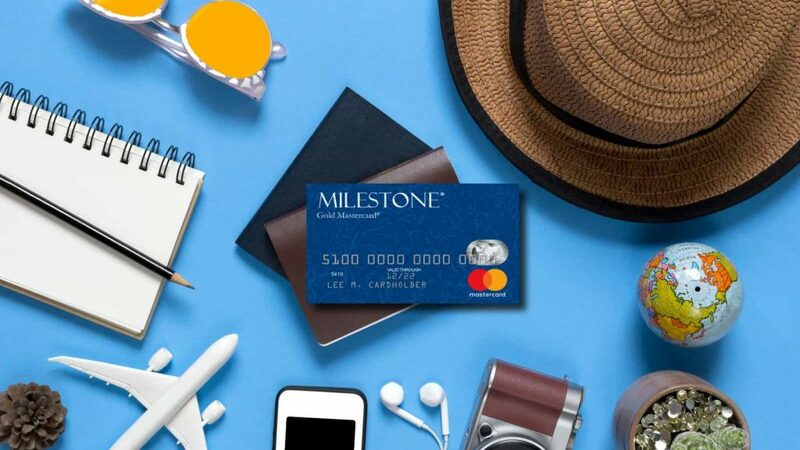 To help you decide whether the Milestone credit card deserves a place in your wallet, we’ll do a comprehensive review of this card. Read on to see how the Milestone Gold Mastercard compares to other credit-rebuilding cards in the market. Opening a Milestone credit could prove to be a major turning point in credit comeback. However, this card isn’t perfect. There is an annual fee as well as a 23.9 percent APR which could prove to be costly. But, when these terms are compared to other cards targeted to consumers with a bad credit score, the Milestone credit cards come out to be better than several of them. Many of these cards charge a processing fee and monthly fees as well as an annual fee and APRs of over 25 percent. Milestone Gold Mastercard cardholders are approved for a $300 limit on the card that may be reduced to $225 if an annual fee of $75 is charged. The annual fee can be as high as $75 or as low as $35 in the first year. With a regular APR of 23.9 percent, a $300 balance that’s paid over a period of one year would generate $41 in interest. People with a poor credit score can get approved for several credit cards. However, those will a really messed up credit struggle to get approved for numerous cards. For example, if you have a bankruptcy on your credit report, you may have trouble getting approved for secured credit cards. But, you may be able to get approved for Milestone Gold Mastercard because they approve people with a very bad credit score. Thus, a Milestone credit card could be the best credit-rebuilding tool available to you. A 23.9 percent APR isn’t inexpensive but it’s relatively low. After all, the Milestone credit card is competing with some of the highest APRs. For instance, the First PREMIER Bank Mastercard Credit Card charges an extremely high APR of 36% (regular). Compared to that, the APR on Milestone Gold Mastercard is low. You won’t be paying a hefty chunk in interest if you make your payments on time. The credit limit on the Milestone Gold Mastercard is $300. But, you won’t have access to this amount as an annual fee of $35 to $75 is charged in the first year. This will shrink your spending power to $265 or $225 respectively. However, if you desperately need $265 or $225 for emergency expenses and don’t have cash on hand, then this credit line may prove valuable to you. A few unsecured cards for consumers with a bad credit score charge a processing fee which must be paid by the cardholder for opening the account. In addition, they charge a monthly fee which can prove to be expensive for the cardholder. They may reduce the annual fee after the first year and start charging a monthly fee to make up for that reduction. Milestone Gold Mastercard doesn’t charge a processing fee or monthly fees, which means you may not have to pay hefty charges for holding this card. Although this aspect of the Milestone credit card may not appeal to you, it is still worth mentioning. The foreign transaction fee on Milestone Gold Mastercard is 1 percent on each transaction. This fee is lower than what competitors are charging i.e. around 3 percent. The annual fee for the first year could be as high as $75 or as low as $35 depending on the cardholder’s credit history. If you’re approved for the card with an annual fee of $75 and your credit doesn’t improve, then you won’t get a less expensive offer at the end of the first year. In fact, the annual fee will increase to $99. Such a cost could prove to be expensive for you. However, compared to most of the unsecured credit cards, this fee is small. You can’t apply for a Milestone credit card directly. Clearing pre-qualification is a must for this card. We believe that the reason consumers are required to pre-qualify is to filter out applicants with major issues on their credit reports. It only requires a soft credit check. So, those who don’t have a chance to qualify won’t worsen their credit situation because of a hard inquiry and rejection. Once you’ve received your Milestone Gold Mastercard, you’ll have to activate it online. Visit this page for account activation and login. Once you’ve registered your card, you can log in by entering your username and password. Inside your Milestone credit card account, you can pay your bill and view your account statements. The account can be accessed 24/7. If you have bad credit and are struggling to get approved for other cards, then the Milestone credit card may be a good option for you. With no processing fee or monthly fees, this card is relatively inexpensive compared to some of the other unsecured credit cards. However, the low credit limit on the Milestone card could be an issue as you won’t get much in spending power. Not only that, but the card comes with an annual fee that varies between $35 and $75 in the first year, depending on your credit history. If your credit history is messy, you may have to pay $75 in the first year as an annual fee, which may rise to $99 if your credit situation doesn’t improve. The Milestone credit card comes with a 23.9 percent APR which is relatively low but isn’t inexpensive. So, the Milestone credit card could be right for you if you can’t qualify for other better cards for credit-rebuilding. If you have good enough credit, you should consider a cash back card rewards card instead. The Chase Freedom Unlimited credit card offers rewards that you can earn while shopping everywhere. You’ll earn 1.5% cash back on every purchases you make, no matter where you’re shopping. Another perk of the Chase Freedom Unlimited is that it’s possible to transfer your points to one of the Chase travel credit cards to make your points more valuable. In a nutshell, the Milestone Gold Mastercard is a good option for you if you have a seriously damaged credit score. The card does come with an annual fee but its APR is relatively low. Moreover, there is no processing fee or monthly fees on the card which makes it inexpensive than some of the unsecured credit cards in the market. If you can’t qualify for a better credit card, then the Milestone Gold Mastercard could be right for you. This is not the only credit card aimed at people with a subprime credit score. There are some other options you should consider that may suit your situation better. The credit cards below are a few of our favorites, especially if you’re looking to rebuild your credit score through responsibly making your payments. The middle card even earns rewards which should offset the annual fee of the card. Extra Perks Quick pre-qualification that won't hurt your credit score. Previous bankruptcy OK. Access a higher credit line after making your first 5 on-time monthly payments. Access a higher credit line after making your first 5 on-time monthly payments. Pay by check, online, or at a local branch. Best for People Who... Have bad credit and need help to strengthen it through responsible use. Need help to strengthen their credit through responsible use. Also earns rewards. Need help to strengthen their credit through responsible use. Here at Travel Freedom, we like to travel, which is why we always prefer to get travel credit cards for ourselves. We also know that travel credit cards are not available to all credit score levels. With anything less than a good credit score it will be hard to be approved for a travel card. Any of these cards will be beneficial in rebuilding your credit so that you’ll have the option in the future of what card type to get. After your credit is good, you’ll have the opportunity to be approved for valuable travel rewards or cash back cards. Good luck on your road back to good credit. It’s great that you’re looking to improve your credit score and the way you live.